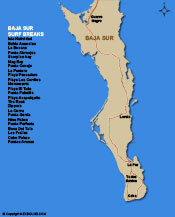 Welcome to the mexbound.com surfing in Baja guide to surfing Acapuliquito. 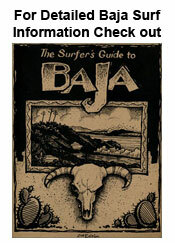 Thanks to our San Diego roots, we're able to provide you with firsthand, detailed information on Surfing in Baja. Before you leave on your next adventure south of the border, be sure to purchase Mexican Auto Insurance from mexbound.com, the surfer's choice. Remember, mexbound.com is "the first choice for the smart traveler." Playa Acapulquito is a mushy reef break with mostly rights. Playa Acapulquito is in front of the Cabo Surf Hotel. Playa Acapulquito is a great place to learn, just be aware that there are the occasional rocks. Since Playa Acapulquito is so easy to find, it gets crowded especially on weekends. Playa Acapulquito breaks good on summer South swells. Playa Acapulquito is the first of the Costa Azul breaks. Costa Azul is the bay that holds the best and most famous surf spots in all of Baja Sur, Playa Acapulquito, The Rock and Zippers.